Built on a newly developed, dancer specific high arch last for true fit, comfort & elegance. The Boost DRT incorporates super lightweight materials and an extensive range of custom designed features to meet the performance needs of the serious dancer. 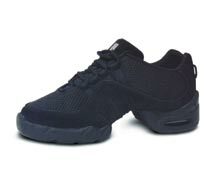 These include: Variable lacing system with custom fit provides support & optimum arch fit. Fully built in arch support & elevation for maximum comfort & feel. BL 538G is also available as children's sizing. Fitting: 1 to 1.5 sizes larger for women; 3 sizes larger for men.